Every week we pull together some great Canadian recipes from Canadian food bloggers around the web featuring one main ingredient or dish. This week we share 22 orange recipes to make the most of citrus season! January is citrus season - and thank goodness. When we're in the depths of dark, cold Canadian winters combined with colds and the flu, we need something bright and cheery with a good dose of vitamin C to pull us through it. The vibrant shades of citrus fit the bill! Today we celebrate oranges in all their colours and varieties. They're the star ingredient in all these orange recipes - whether sweet or savoury. Enjoy! 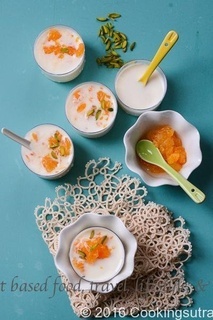 **[Komla Lebur Payesh](http://www.cookingsutra.com/komla-lebur-payesh-orange-pudding/)** is a sweet Indian orange pudding that makes the most of seasonal oranges. From **Cooking Sutra**. Candied Cara Cara Oranges make these **[Orange Curd Meringue Tarts](http://www.isugarcoatit.com/2017/01/candied-cara-cara-curd-meringue-tarts.html/)** look like works of art! From **I Sugar Coat It**. Citrus adds the perfect sweet-tart balance to this **[Orange and Avocado Salad with Parmesan Crisps](http://www.flavourandsavour.com/orange-and-avocado-salad-with-parmesan-crisps/)**. From **Flavour and Savour**. With only split yellow pigeon peas, tomatoes and oranges and seasoning, this simple **[Citrusy Split Pigeon Pea Soup](https://coniferesetfeuillus.com/2017/01/02/citrusy-split-pigeon-pea-soup/)** with warm your toes. From **Conifères & Feuillus**. A double dose of citrus with these **[Blood Orange and Kumquat Hazelnut Tarts](http://yummyworkshop.com/2015/03/12/blood-orange-and-kumquat-hazelnut-tarts/)**. From **Yummy Workshop**. This bright **[Winter Citrus Watermelon Salad with Fresh Bay Laurel](http://yummybeet.com/winter-citrus-watermelon-salad-with-fresh-bay-laurel/)** will brighten the darkest winter day. From **Yummy Beet**. Add some orange zing to salmon with **Eat Spin Run Repeat**'s super simple **[Baked Salmon with Citrus and Herbs](http://eat-spin-run-repeat.com/2016/04/13/baked-salmon-with-citrus-and-herbs/)**. Indulge with this healthier **[Paleo Dark Chocolate Orange Fudge](http://pureandsimplenourishment.blogspot.ca/2014/04/paleo-dark-chocolate-orange-fudge-paleo.html)** (also vegan and gluten free). From **Pure & Simple Nourishment**. Healthy comfort food at it's best: **[Orange Chicken with Black Rice](http://www.joyoushealth.com/blog/2017/01/02/orange-chicken-black-rice/)**. From **Joyous Health**. You don't need to be celebrating Christmas to enjoy this festive **[Mexican Christmas Salad](http://www.diversivore.com/recipe/mexican-christmas-salad/)**. From **Diversivore**. Pomegranates and oranges are in season together so why not combine them in this **[Pomegranate Mandarin Cheesecake](http://thefoodblog.net/pomegranate-mandarin-cheesecake/)**. From **The Food Blog**. Cranberries and oranges compliment each other well so pair them up in these gluten free **[Cranberry Orange Muffins](http://leelalicious.com/gluten-free-cranberry-orange-muffins/)**. From **Leelalicious**. What a zesty collection! Thanks for the inclusion! Yum! These all look like great recipes to try this orange season!